Today, I’m throwing all my blogging knowledge out the window. I just want to sit down and chat with your guys about some pretty exciting things that have been happening over here. You probably already know since I’ve been talking about it so much… but last week I launched The Blog Biz Bundle. Now we’ll talk all about this product in a bit, what’s included, what you’ll get out of it, and how you can get your hands on it. But for now, I want to talk about how it came to life. At the beginning of this year, I set some pretty big goals for myself. I tend to love big goals! So I set a goal for myself to be making around $9,000 a month at the end of 2018. That way I would be on track to making $100,000 in 2019. But at the time that I made that goal, I was making around $300 a month from my blog. So I knew that I had a long way to go. Well for me it’s not enough to use set yearly goals. Because looking at that goal of making $9,000 a month, that’s pretty scary when you’re currently only making a couple hundred a month! So I set 4 main goals for myself to achieve in the first quarter of the year. And one of those goals was to improve my passive income to $1,000 a month. I knew that I wanted to create and launch my first real paid product. But at the time, I had no idea what that was going to be. After getting closer to you guys and asking you some questions on Instagram, I learned that the majority of you want to grow your blogs but don’t have a plan in place to do so! And because of that, you’re struggling to actually grow. That was the start of something big for TCB. And I’m so excited to share its story. When I started to brainstorm ideas for my paid product, I thought about creating an e-course or an e-book. But for some reason, that just didn’t sit right with me. I didn’t honestly think that either of those options would be enough to really make an impact on people’s lives. And with the main goal being to help you to create a plan that will actually grow your blog, I was struggling with what to do. So after some looking at what other people I look up to were doing with their paid products, I decided to go a completely different route! In one day, I had brainstormed The Booming Blog Starter Kit. It included 5 lectures, 3 ebooks, 3 media kits, and 1 checklist. In the same day, I mapped out all the projects that I’d have to complete, the date of launch, and how much it was going to sell for. Now, this was way back in January. And at the time, I have no idea that The Booming Blog Starter Kit was going to transform into something totally different. But in the next 2 months, the name changed and so did the information included. And a big thanks goes to you guys! When I started working on this product, I knew that I had to do a lot of validation and testing. I wasn’t willing to have another paid product flop. Did you even know that I had one flop before?! I tell the whole story in my e-book, The Blog Hustler. So before I even decided on what I was going to create, I surveyed my audience on Instagram. And then I did it a couple more times to finalize my thoughts. Then I took about a month creating bits and pieces of The Blog Biz Bundle. When I had a sample of just about everything that was going to be included, I turned to my VIP team to get some help! Who better to test out my product than people who were already invested in me?! And let me tell you, my audience is amazing! Within hours I had several people respond to my email wanting to help me out with my product. Because of these ridiculously amazing people, my product completed transformed. I got rid of 1 ebook, I added mini-lectures, I changed the order of my TCB Master Classes, I revamped lectures I had already shot, added worksheets, and so much more. After a week of revamping the bundle, it was ready for launch. And now today I get to share The Blog Biz Bundle with you, my dear friend! I can’t believe that this day has come. I’ve been dreaming of writing this welcome blog post for a long time. But at the same time, I pushed it off for a week because I wasn’t exactly sure what to say. And honestly… I kinda thought that it wouldn’t fit with all my other blog posts. So that’s why I said “heck with it” and threw everything I knew out the window to just be raw and real with you guys. But without any further ado… I want to introduce The Blog Biz Bundle! 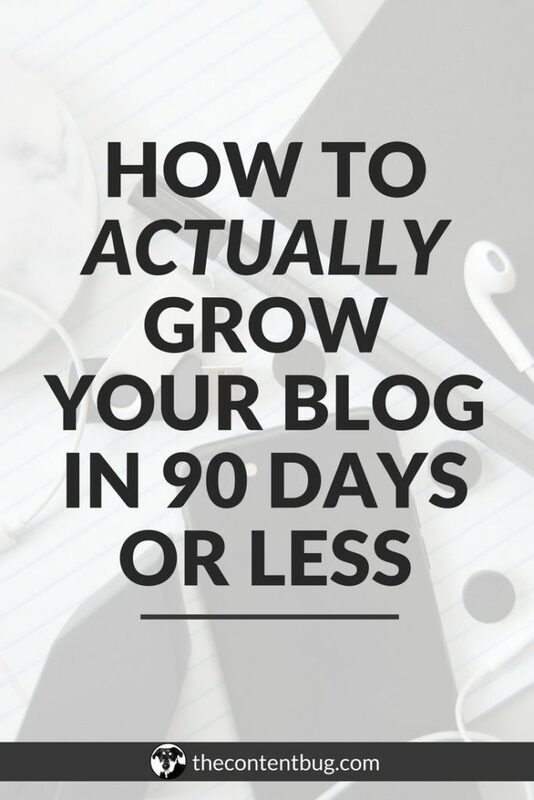 Do you want to grow your blog in 90 days or less? Then listen up! 6 months after launching my blog, I felt like I was just wasting my time spinning my wheels. I was working over 30 hours a week and I didn’t have anything to show for it other than a new blog post every week. My website traffic was the same, my social media following was experiencing extremely slow (if not stagnant) growth, and I wasn’t making any money. So after trying to follow all the strategies and soak up as much free knowledge as possible, I decided to try a new strategy. 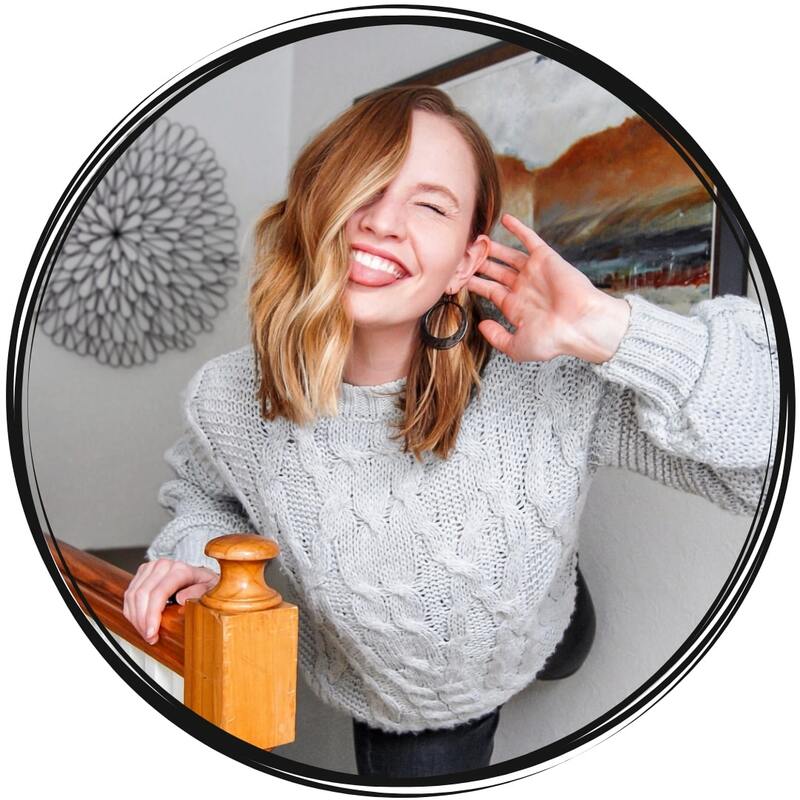 And within the next 3 months, I was able to start generating over 100 email subscribers a month, I doubled my pageviews, and I was able to leave my full-time position to take my blog biz full-time. 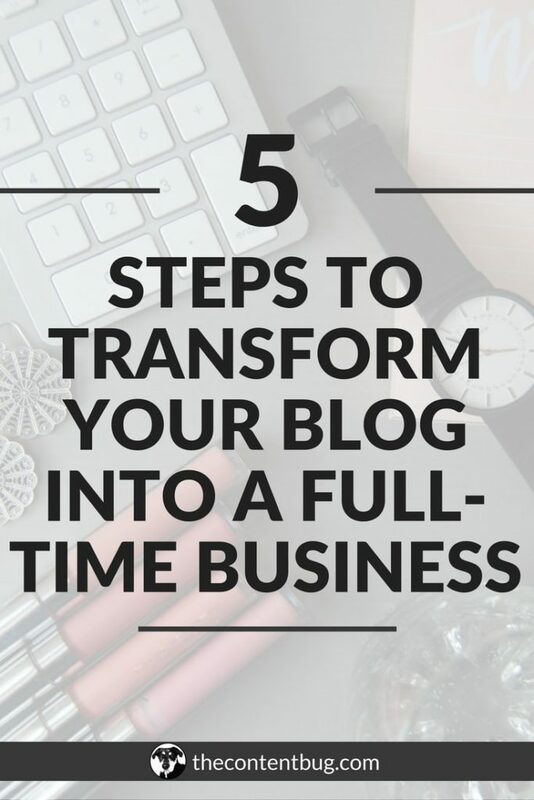 Now I want to help you grow your blog so you too can transform your blog into a real biz. So I want to ask you, are you struggling to grow? Do you think that your blog can be successful but it’s taking much longer than you hoped to get to the success you’re looking for? If you want to grow but you have no idea how to do it, then this bundle is for you! 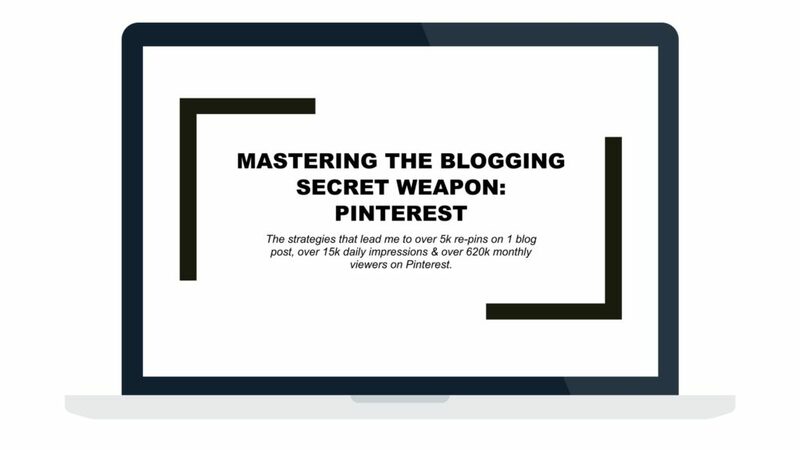 With all the information included, you’ll not only create a plan that is guaranteed to succeed, but you’ll also learn the strategies you need to grow your blog in all areas! Coming up with what’s included in this bundle was tough! There was so much that I wanted to include to make it informative and actionable. 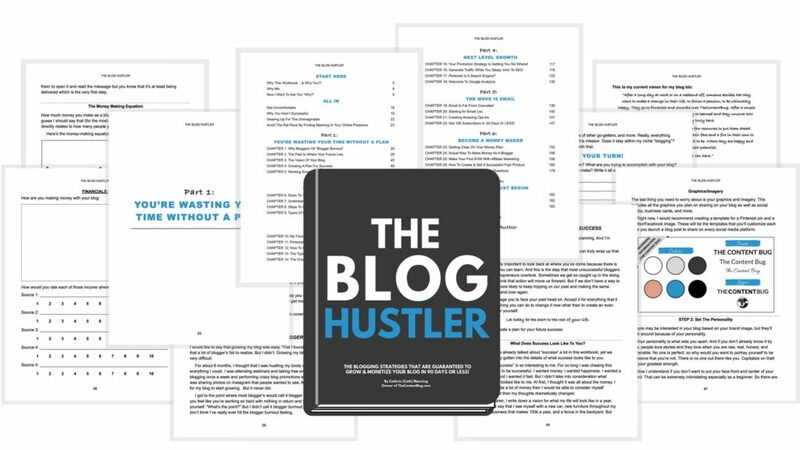 But at the end of the day, I came up with 5 exclusive TCB Master Classes, a vault of mini-lectures, The Ultimate Guide to Productivity, 3 media kit templates, my blog post promotion checklist, and The Blog Hustler (my 150+ page ebook!). So let’s break each of those down. Each lecture includes video content that’s 35 to 60 minutes long talking about exclusive content that I haven’t shared on my blog or social media! These are filled with strategies and action steps to improve your blog design, drive traffic, improve your SEO, generate more email subscribers and create a plan that will help you to stop treading water and create actual growth. Included with each lecture is a worksheet to help you navigate the lecture and give you action steps to make the most out of each of them! These are less than 10 minutes videos going more into detail about keyword research, how to understand and fix crawl errors, and how to automate your email freebies. My plan is to continue to add more mini-lectures in this section as people in the bundle have questions! So if there is another mini-lecture you would like created, just let me know! “I’m jealous of your hustle.” – This is something I get told a lot more than I’d like to admit. I wouldn’t say that my hustle is very different from yours! I’ve just learned how to properly manage my time to get more done. In this guide, I’m sharing my best productivity insight and spreadsheets to improve your productivity levels every single day! Available for easy design on Canva, you’ll get access to 3 unique templates to create a media kit that you’ll send to brands to land sponsored posts and other brand deals. Just like it sounds like. This is my checklist that I use to help promote each blog post I share on my blog! Organize your blog promotion in a simple checklist to keep track of where you promoted your blog and where you still need to promote it. 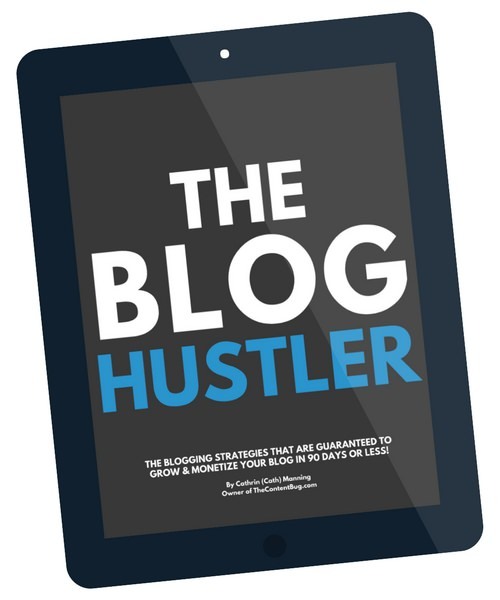 I wouldn’t consider The Blog Hustler 100% an ebook because it’s actually a workbook! 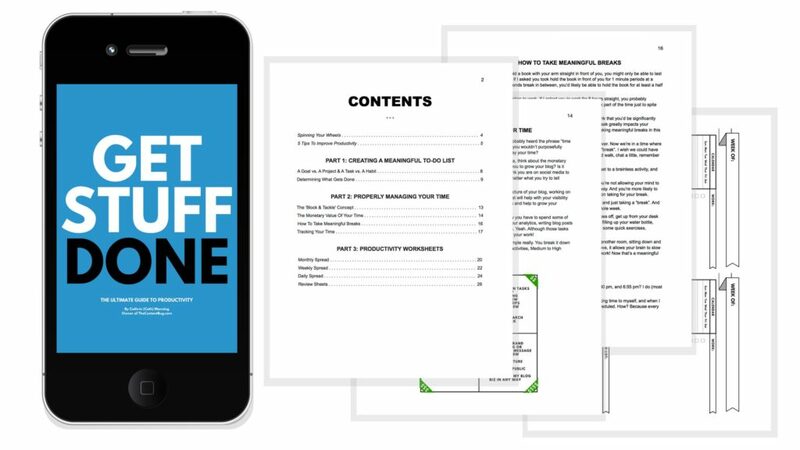 With over 150 pages filled with strategies and worksheets, you’ll find clarity with your blog, learn the strategies that are guaranteed to help you grow, and create a plan that will make your success inevitable in just 90 days or less! 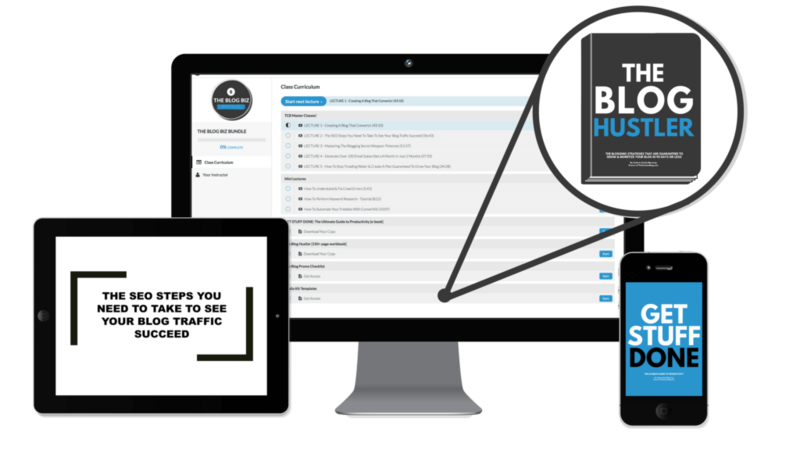 This workbook holds all the secrets that have led me to grow my pageviews, social media, and email list even as a beginner blogger. That’s why I’m so confident that it will help you grow too. Yeah, yeah I get it. Typically I don’t believe in a product until I hear what other people have to say about it. Rarely will I ever make a purchase, especially on Amazon, if I haven’t read at least 5 reviews. So thankfully, I’ve had some pretty awesome people already working away with the bundle that wanted to share their thoughts with you! I mean, how awesome are they?! 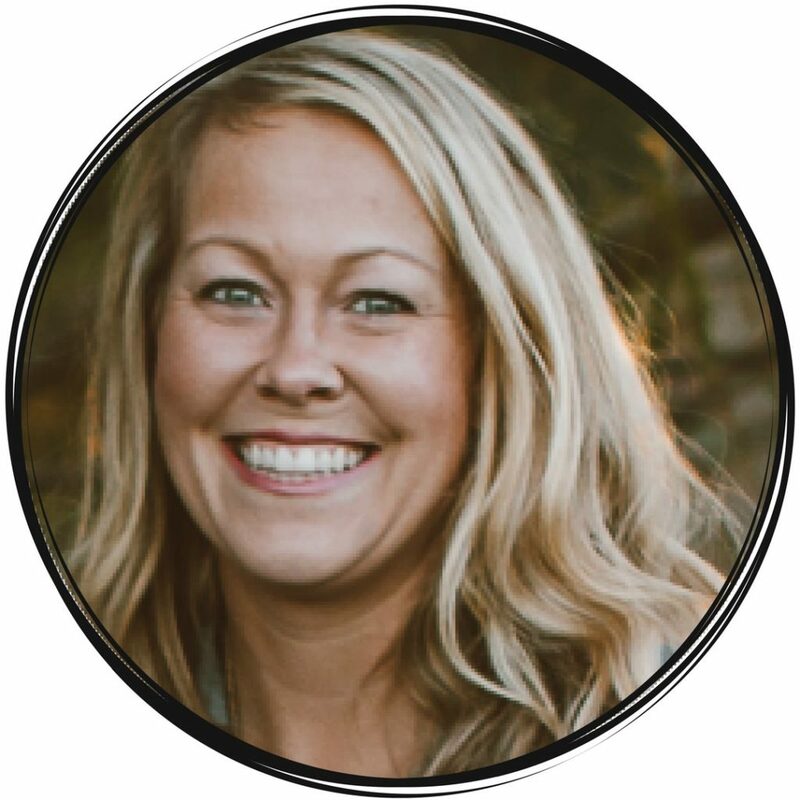 Then there’s Gwendolyn from RealWorldHomesteaders.com, another amazing woman who has grown her website traffic dramatically since starting to use my strategies! “Cath’s class has literally been a life saver for my blog. I started my blog a year ago. I love to write, and I wanted to connect with others around the world that are passionate about the same things that I am. As fellow bloggers, you know that we spend many hours putting together quality posts. If your post goes no farther than your own computer screen, then what’s the point? I tried everything I knew to do to promote my blog. I posted on numerous social media sites and paid for boosting but still didn’t receive the results that I was looking for. 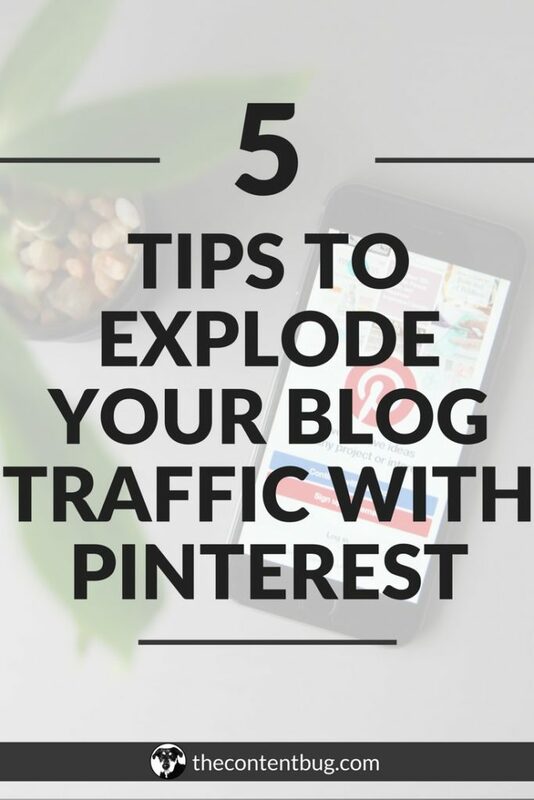 I was considering closing my site and cutting my losses when I discovered The Content Bug on Pinterest. Cath knows how the internet works and how to drive traffic. Fortunately for us she is wanting to share her knowledge! Her courses are well planned and will speak to your individual learning style. 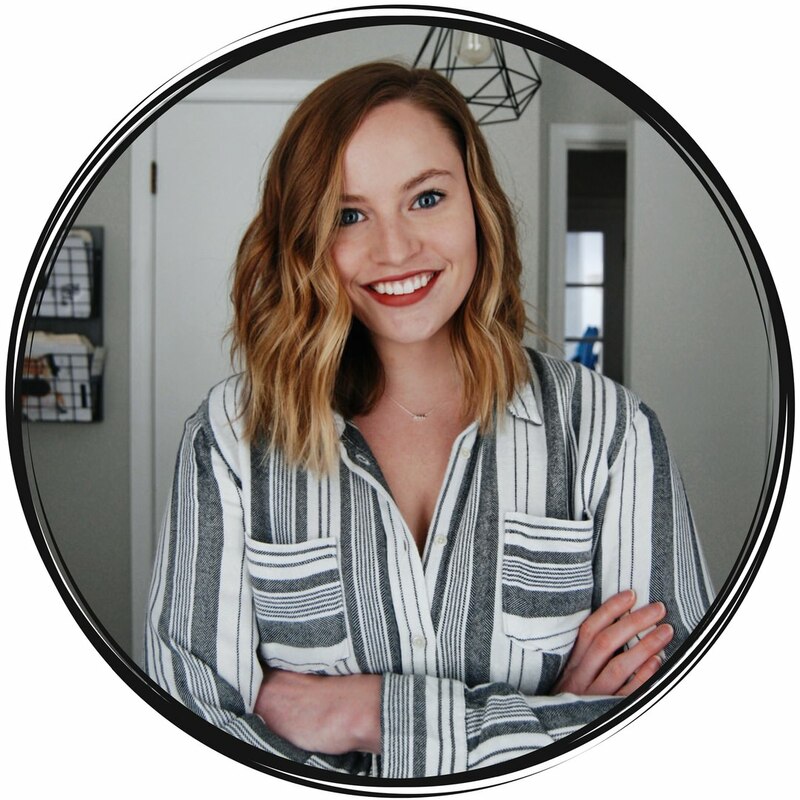 She has worksheets, videos, planners and how-to’s that will walk you through the behind the scenes programing that drives your blog on google, Pinterest and other search engines. 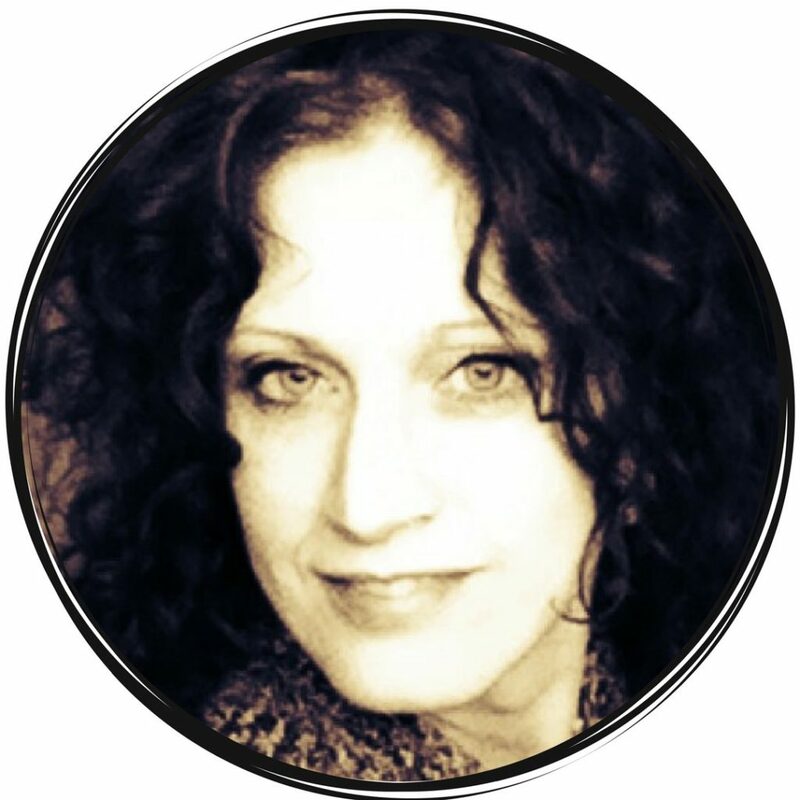 She will guide you in your site layout design, SEO, plug-ins that matter, e-mail lists and more. In the past two weeks since I have begun to implement her techniques, my blog traffic has increased over 400%! SOUNDS AMAZING! HOW CAN I GET IT?! 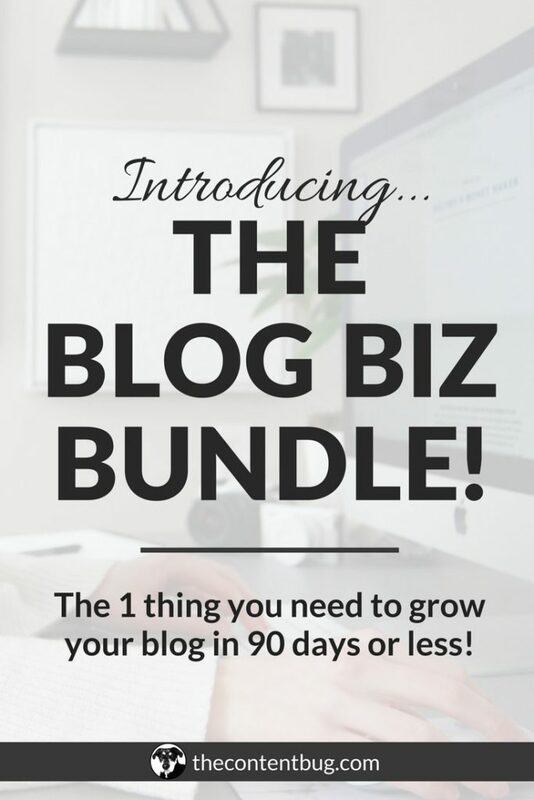 If you are ready to get your Blog Biz Bundle, click here to get started now! Get instant access to all the information that’s included! It’s that easy, I promise! And if you want more information, just scroll through the sales page and take a look at what other members inside the bundle have to say. But if you are ready to make an investment in your blog biz to see real results, then you can go ahead and get The Blog Biz Bundle today! Soon I’ll be creating a blog post about everything I learned about creating and launching a successful product. But for now, I’m still soaking up the bliss of the launch and I’m not quite ready to go into detail about all the wins I’ve had and lessons I learned. So stay tuned for a blog post in the next couple months sharing more detail on how I created this product, have 7 people buy it before it even launched, my launch strategy, actual numbers from my sales, and more. Until then… thanks for being a part of the TCB community! 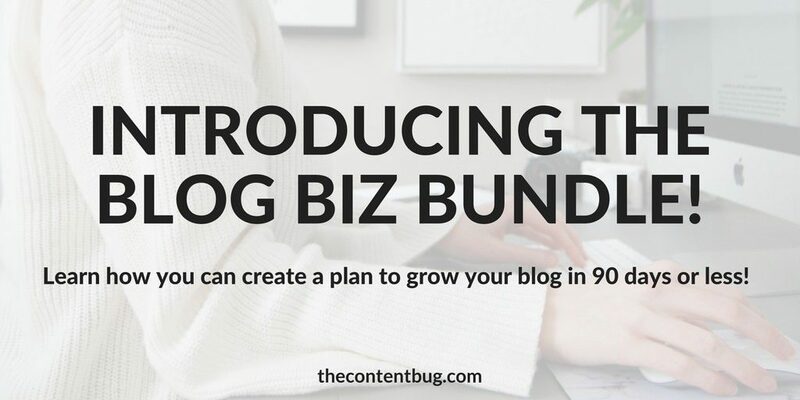 And if you want to be featured on TCB as a blog biz success story thanks to the bundle, make sure you reach out to me through email (thecontentbug@gmail.com) or Instagram (@thecontentbug)! I can’t wait to see what you’re going to accomplish in the next 90 days!